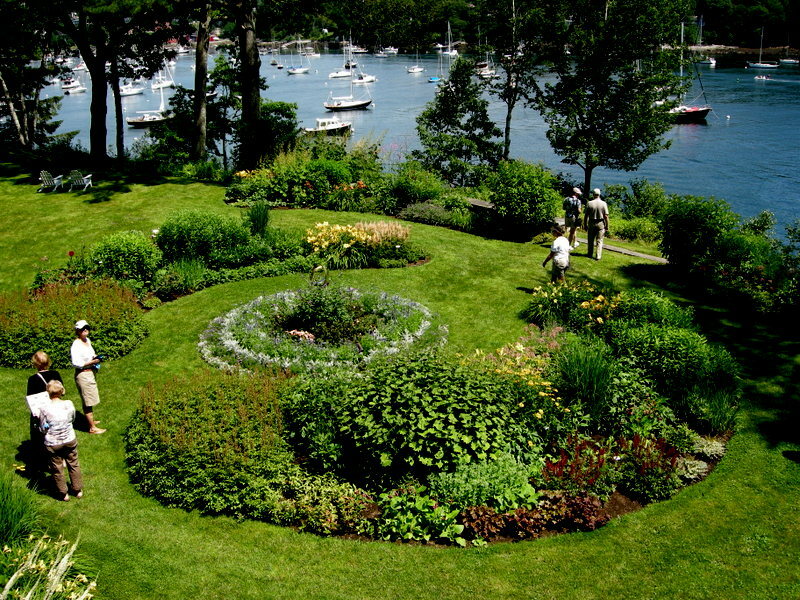 The last garden on the Camden Garden tour has sweeping views of Rockport Harbor. Before I get to the post, I want to let the customers of Carolyn’s Shade Gardens know that we will be reopening for the fall in mid-September. As usual there is a packed schedule including low maintenance gardening seminars, a double hellebore offer, and an opportunity to buy shrubs and vines. The first open house sale is scheduled for Septmebr 28, and cyclamen breeder John Lonsdale will be making a guest appearance with his gorgeous, fall-blooming hardy cyclamen. You will start getting emails shortly with all the details. 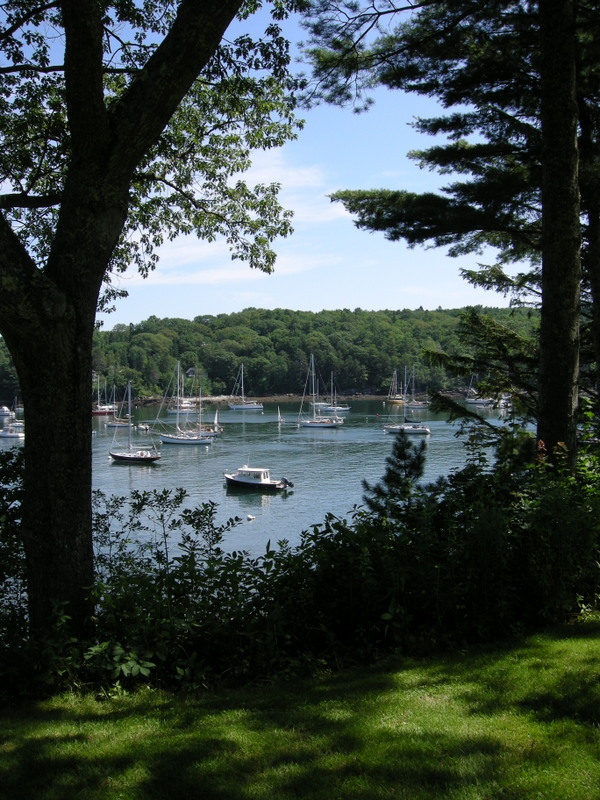 Another view of Rockport Harbor from the Holmes garden. This is the last installment of the posts on the gardens featured on the 66th Annual Camden House and Garden Tour, which I attended in July. 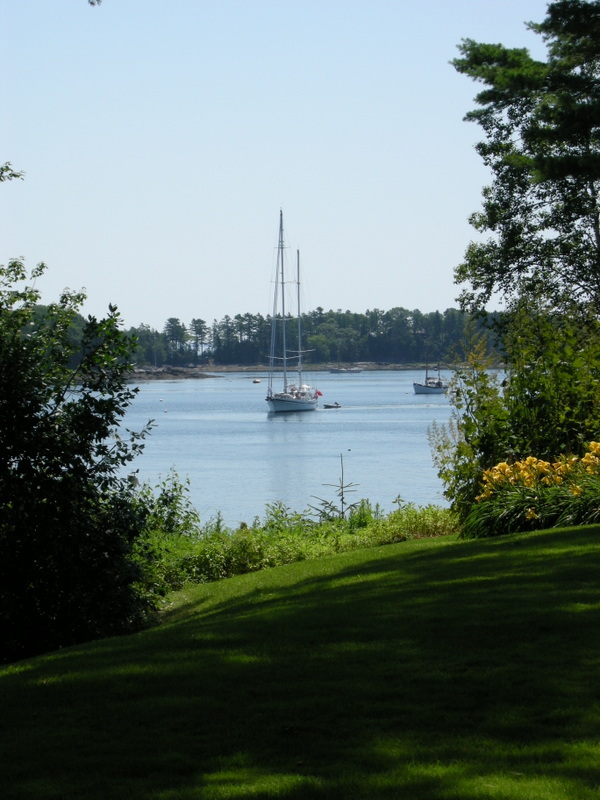 For photos of the Camden and Rockport, Maine, area and profiles of the first four gardens on the tour, read part 1 by clicking here. 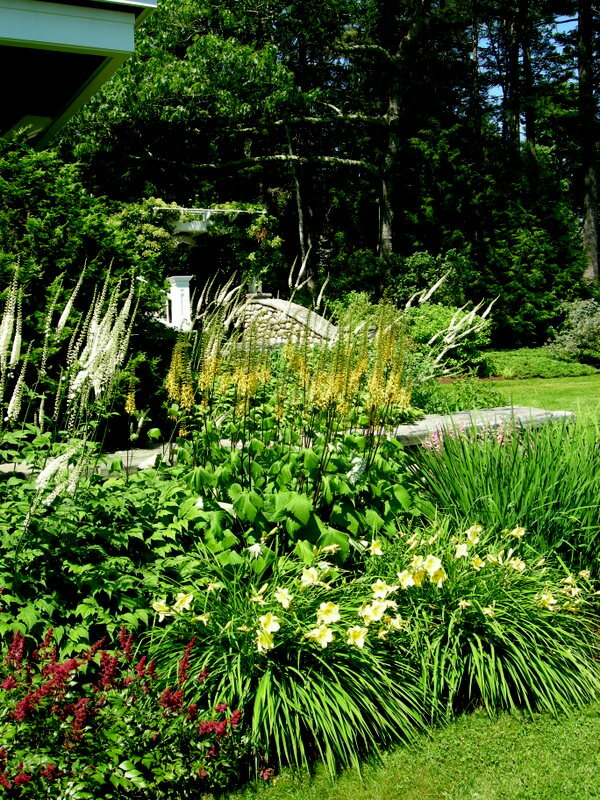 Part 2, which you can find here, features the fifth garden, a classic Maine cape with a gorgeous perennial garden. This post will focus on the Holmes house and garden, a palatial estate covering five acres overlooking Rockport Harbor. 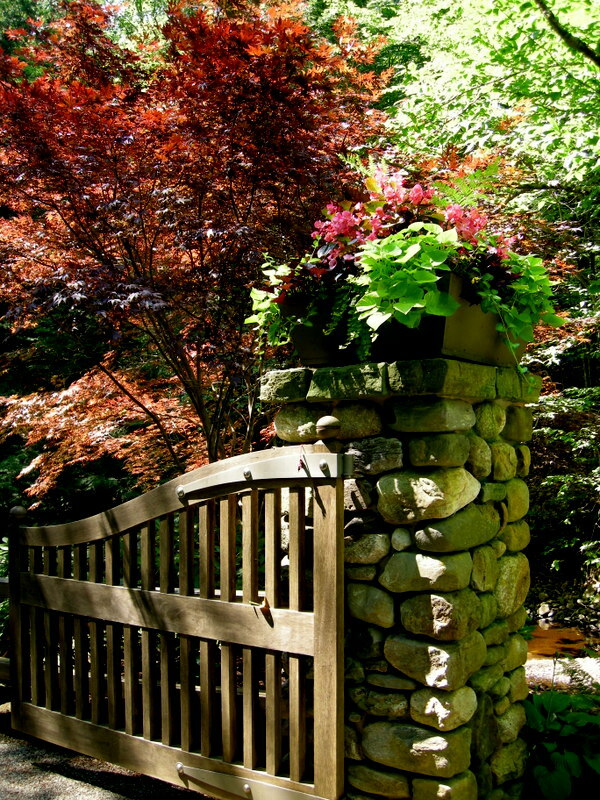 The entrance to the Holmes garden is quite lovely with this handsome, stone-pillared gate opening onto a handmade bridge bordered by woods. As we crossed the bridge, we came upon this dwelling, which we thought was the featured house, but it turned out to be the caretaker’s cottage. I want that job! 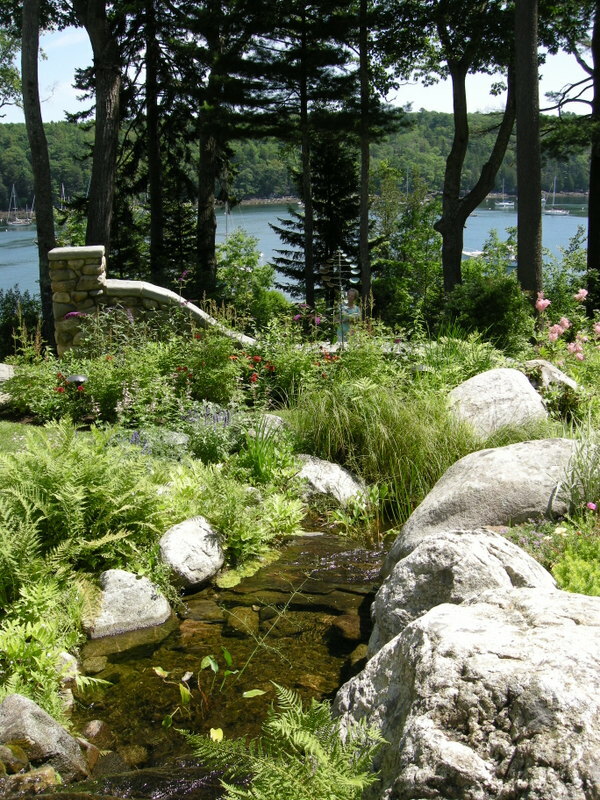 Looking out from the house, across the perennial gardens and lawn, through the encircling edge of woodland to the harbor. 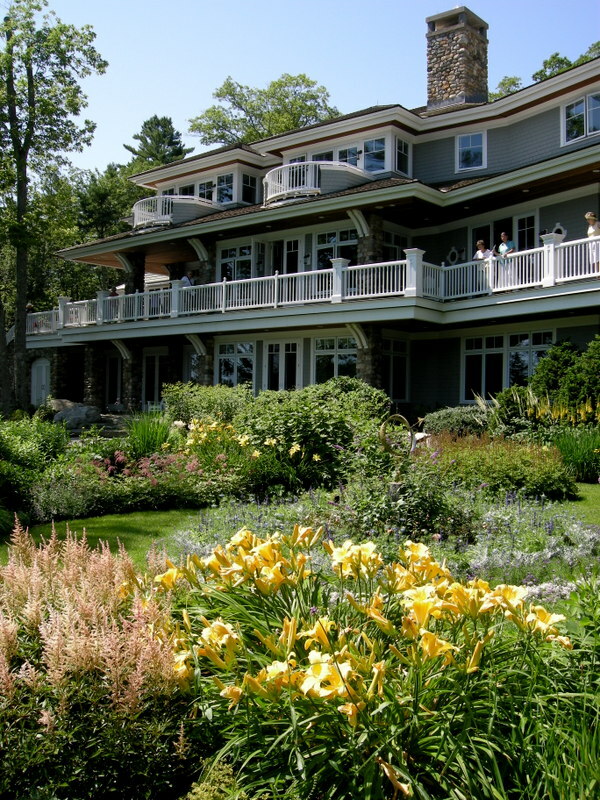 Between the house and the ocean are massive shrub and perennial gardens . A lot of the plants were shade plants at their peak. I wish I could have gotten more photos, but it was noon on a bright and sunny day, great for viewing but not so hot for photography. 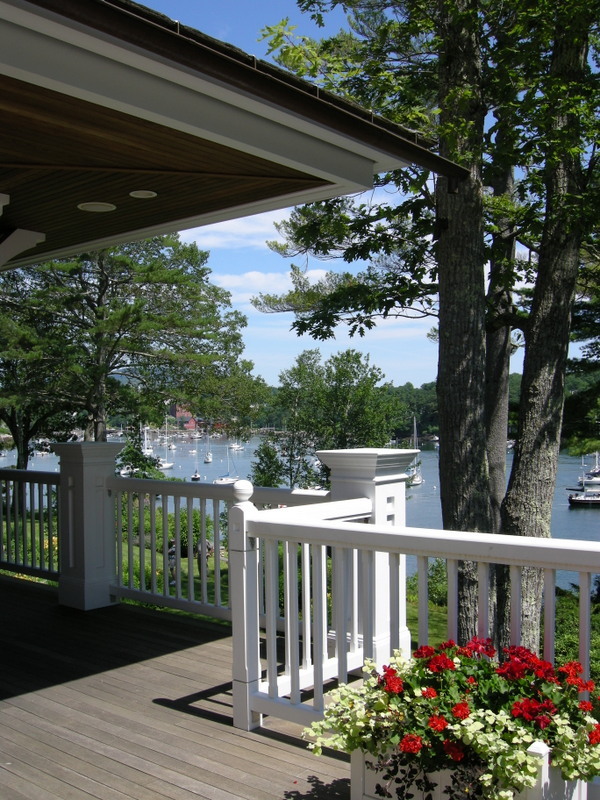 Looking down from the porch that extends the length of the house to an elegant circular garden in the center of the lawn area with the harbor as backdrop. Up on the porch looking out. Particularly notable in the design of the house and gardens was all the beautiful stonework in the extensive walls, stairs, and patios. 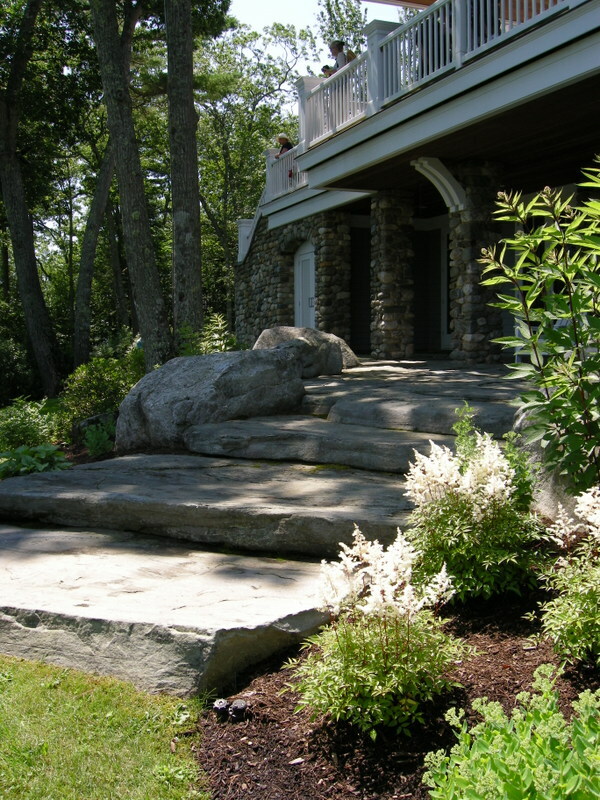 Stone was used especially well in the pool area and the pond and stream that surround it. 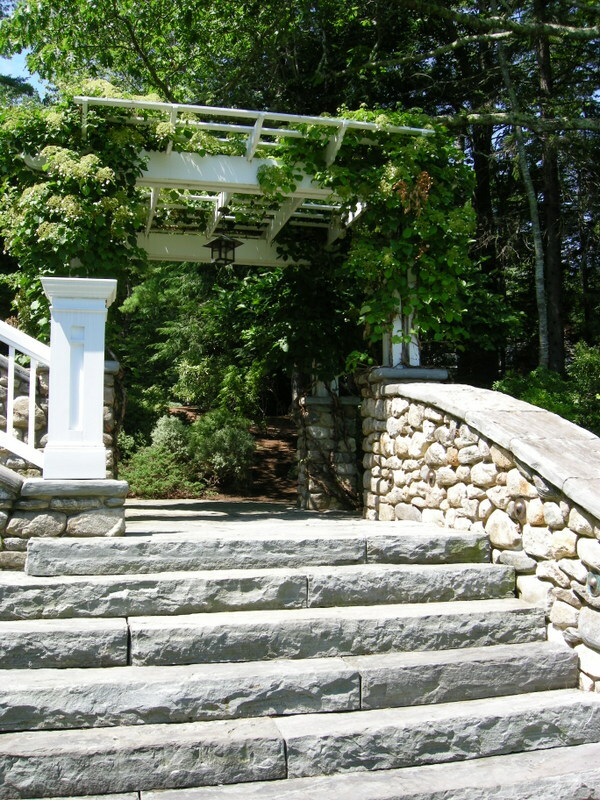 Stone stairs leading to an elegant pergola over the full shade garden on the front of the house. Stairs on the side of the house along the stream on the way to the pool. The pool area: a naturally planted stream runs under and on both sides of the wide stone bridge in the middle of the photo. Looking down the stream with the harbor in the background. 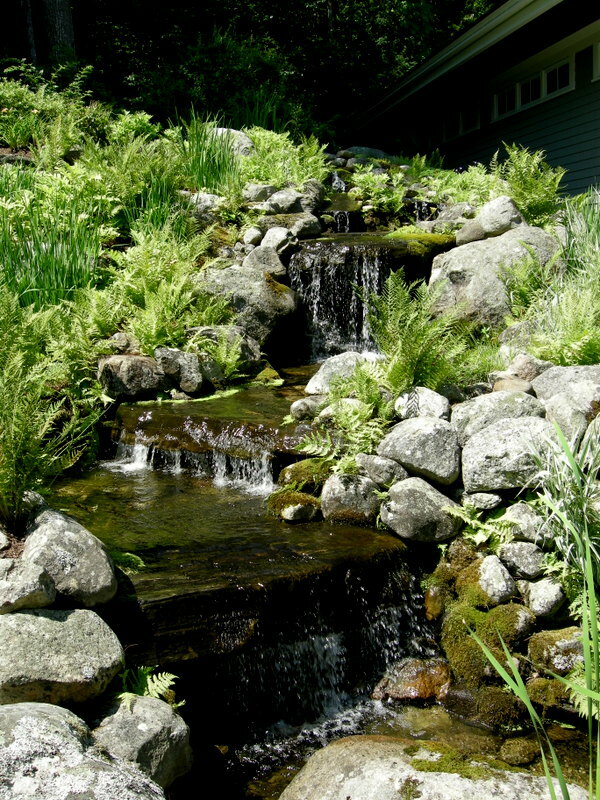 The boulder stream pours over several small waterfalls as it heads down the hill and under the stone slab to the pond. 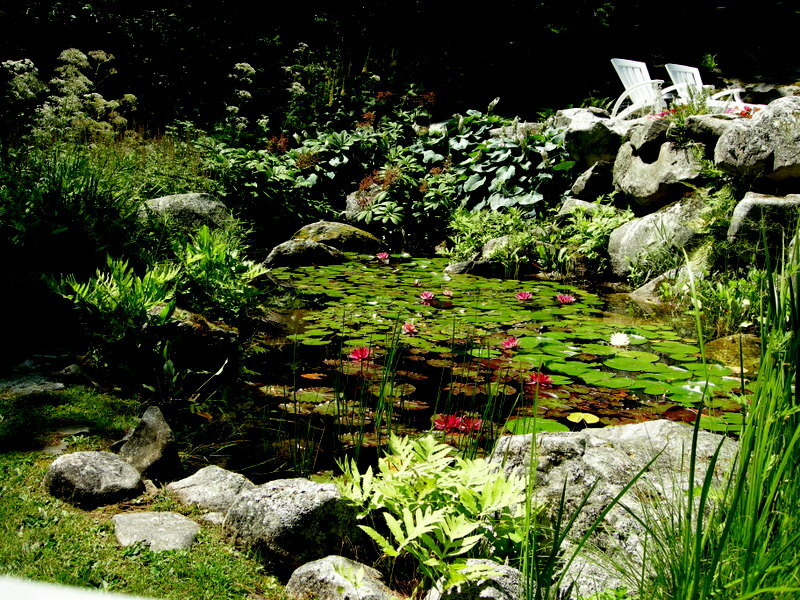 The waterlily pond lined with boulders. Looking back at the house from the harbor’s edge. 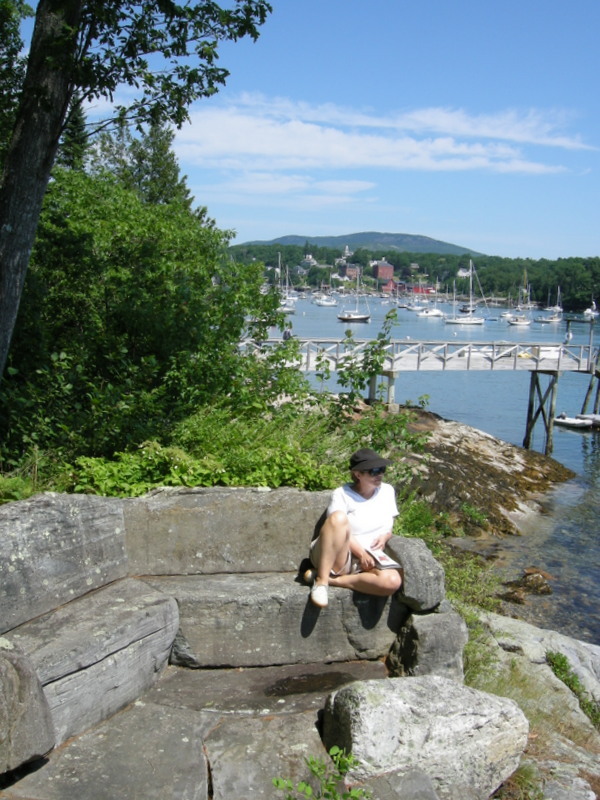 A path leads through the woods at the edge of the harbor to a stone couch with a view over the water to the open ocean. I could have stayed there all day. 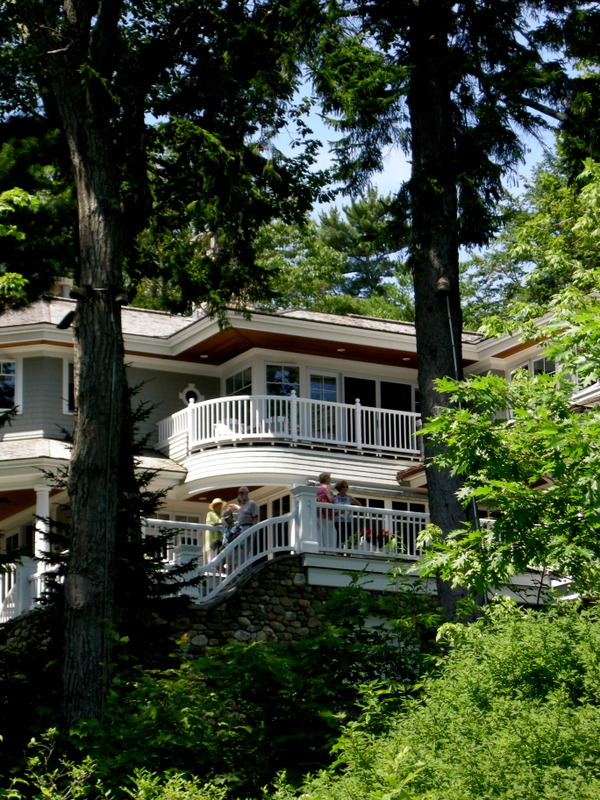 Click here, Camden House and Garden Tour , for information about next year’s tour on July 17, 2014. Nursery Happenings: Carolyn’s Shade Gardens will reopen shortly with a packed schedule including low maintenance seminars, an open house on September 28, a double hellebore offer, and a chance to order shrubs and vines. Customers on my email list will get an email shortly. 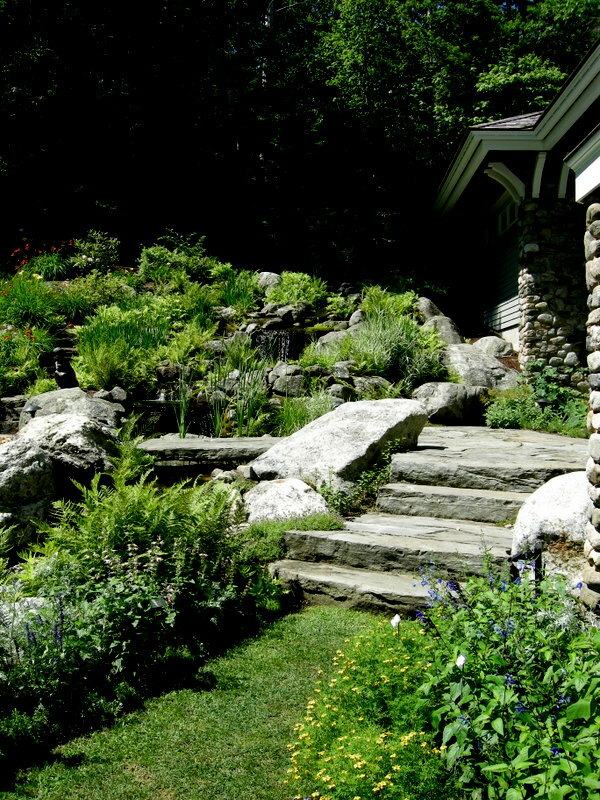 This entry was posted on August 31, 2013 at 9:54 pm and is filed under Garden Tour, landscape design, Maine with tags Camden Garden Club, Camden Garden tour, Camden Harbor Maine, Camden House and Garden Tour, Camden Maine, Carolyn's Shade Gardens, maine gardens, Rockport Harbor Maine, Rockport Maine. You can follow any responses to this entry through the RSS 2.0 feed. You can leave a response, or trackback from your own site. Such a lovely house and garden! With views like those, you hardly need a garden. I liked the way some of the views were glimpse s through trees, framing a view is so important rather than just leaving it completely open. It makes you look and appreciate it more. This has been an interesting series of posts. 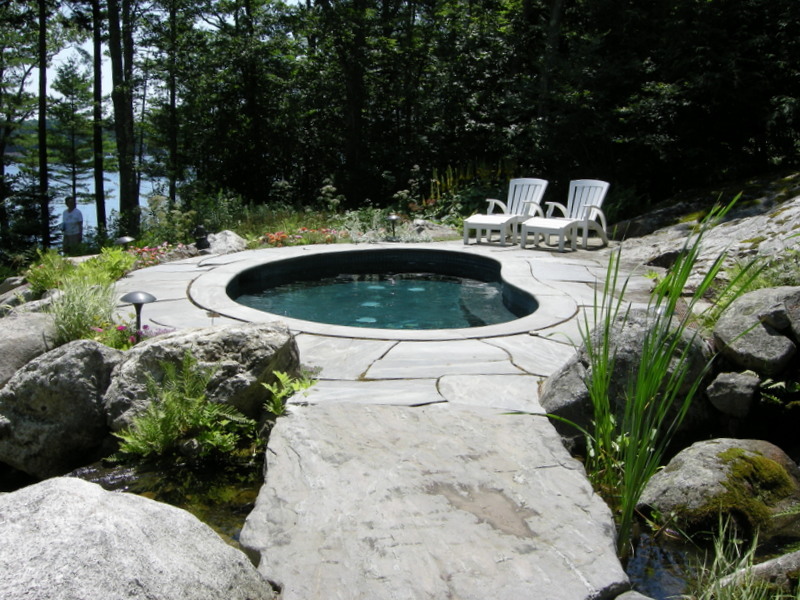 I like the circular garden and that stone seating looking over the water. I think I need a stone couch. It was actually quite comfortable. I appreciated that all the homeowners opened their properties to the hundreds of visitors attending the tour. The Holmes “cottage” is on a par with some of the Newport “cottages”! What eye candy! Thanks so much for the great photos! The inside of the house was quite beautiful too. The owner is a very talented furniture maker and had constructed an amazing high boy and a desk. Very beautiful property and grounds. I would have loved to see it, inside and out. I agree with you, i too prefer a more simple lifestyle. That house looks like it holds a lot of stately parties! Wow Carolyn what a grand place…I love porches overlooking the water…well my hopes to visit your nursery this fall have been dashed. As I figured work will interfere. I have to travel to our state capital for a week of training in late September, and another project in October. At least we know when all the training is that is required this year. So looking forward to May. Lovely place, Carolyn. That “couch” almost looks soft and cushy! I think I would have taken a dip in that pool! The house reminds me of Dallas or Dynasty that I used to watch as a kid. I can’t remember what their gardens were like though. 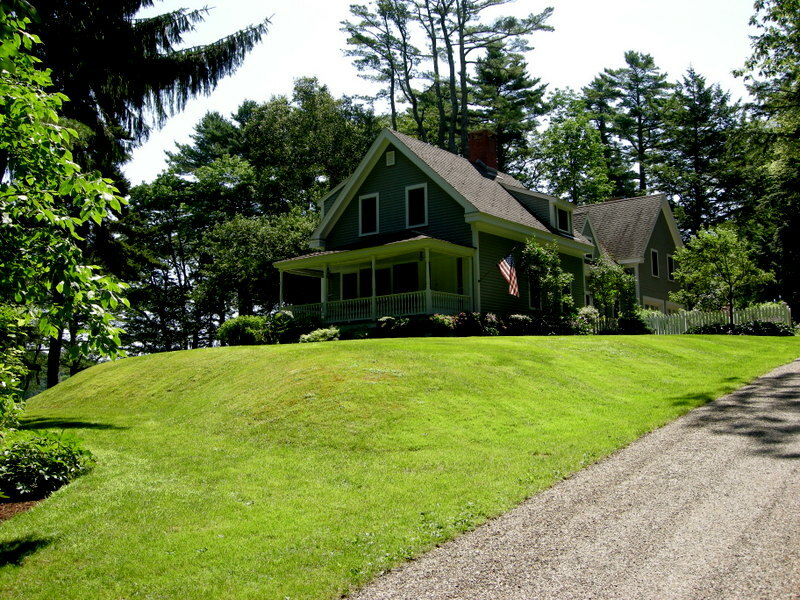 I agree, I would not mind living in the caretaker’s cottage! 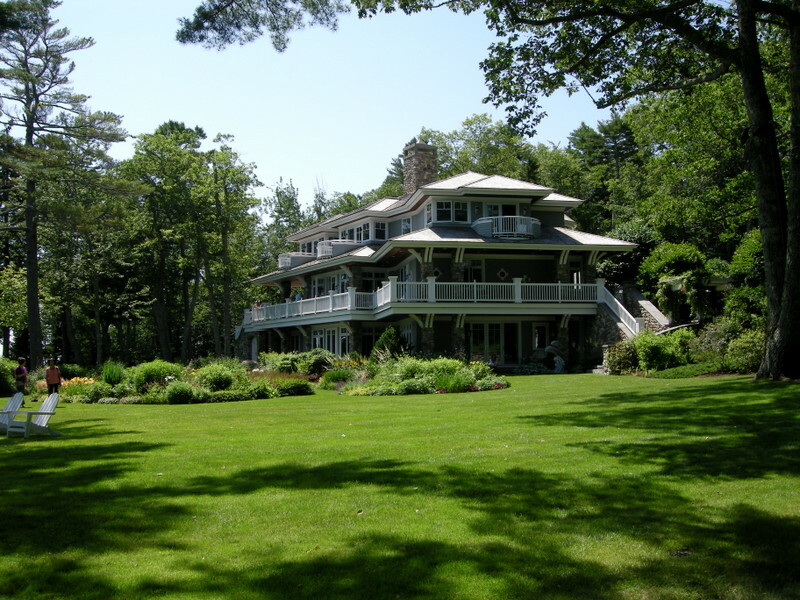 The main house is beautiful, and the garden and water views are breathtaking. I love all the stone work. I can imagine what a grand lifestyle the family that originally owned this place must have had. We are moving to a village named Holmes Chapel, its not exactly as picturesque as these images you show us but its pretty cool in an old mannie sort of way. 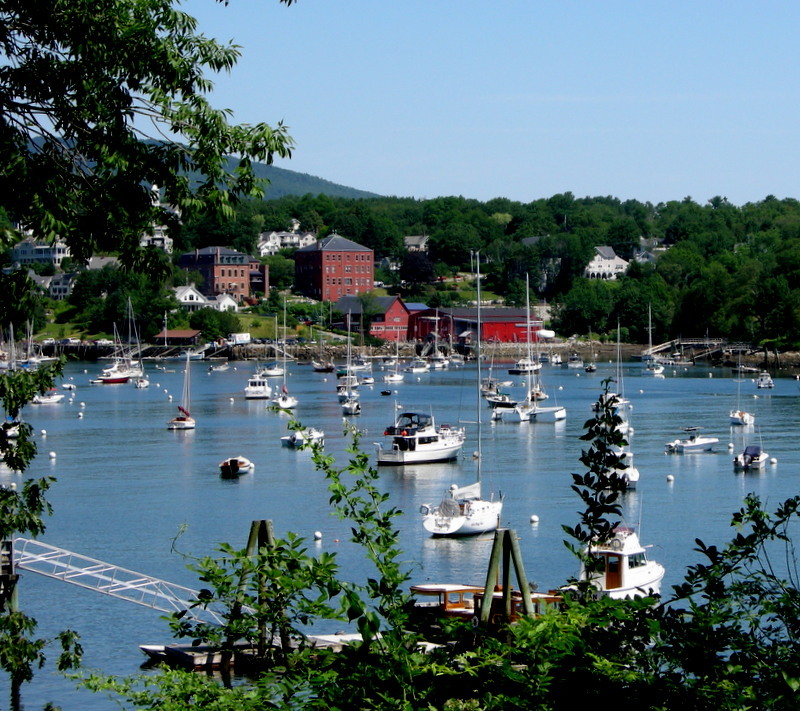 Love Rockport Harbor. I don’t know why more pools aren’t designed to look like part of the greater landscape.